38 Degrees responds to criticisms of its neutral stance in the EU referendum, saying that it is committed to inclusive, participatory democracy. The second part of our debate over what 'neutrality' means in these fractious times. 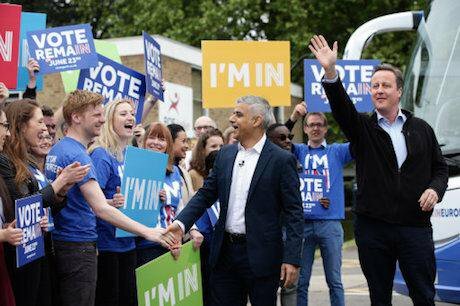 Labour's Sadiq Khan joins David Cameron on the 'Vote Remain' campaign trail. Photo: Yui Mok / PA Wire/Press Association Images. All rights reserved.Martin Shaw has recently criticised 38 Degrees for adopting a neutral stance on whether or not the UK should leave the European Union. Quite a lot of members voted for Brexit on 23 June; probably around half. It’s no wonder that some people find this surprising – Brexit is a polarising issue, and it’s been widely observed that social media feeds can amplify a sense that all our friends share all our views. Particularly in the immediate aftermath of the vote, when emotions were running high, I heard some 38 Degrees members on both sides of the divide express incredulity that they shared values and campaigns with people who’d voted the opposite way to them. But plenty of other 38 Degrees members could easily understand the opposite point of view, even on 24 June. The reality is that good people who share similar values made different choices. 38 Degrees members who voted Leave have previously participated, in similar numbers to those who voted Remain, in campaigns to protect the NHS, challenge the TTIP trade deal, stop cuts to tax credits, welcome refugees or ban bee-killing pesticides. Understanding and serving the wishes of 38 Degrees members on the EU referendum – and its aftermath – was and remains a tricky task for the 38 Degrees staff team, and I wouldn’t for a minute claim we’ve always got it 100 per cent right. But before I go on to explain our approach in more detail, I want to challenge the assumption which seems to underpin much of Martin Shaw’s analysis. He seems to believe that not siding with Remain, and “arguing about the terms of Brexit, rather than Brexit itself” means “38 Degrees can no longer be seen as a major home of the progressive community in Britain” because it signifies a betrayal of 38 Degrees’ mission and values. Shaw suggests that seeking to maintain the involvement of 38 Degrees members who voted Leave could only have been done for cynical reasons. His “most generous interpretation” is that “in a movement that is crowdfunded, the loss of ten or twenty per cent of supporters would have had significant financial implications.” Actually, the key principle driving the staff’s approach was that 38 Degrees members who voted Leave are just as much 38 Degrees members as those who voted Remain. Shaw has got good reasons, underpinned by good values, for his passionate support for remaining in the EU. However, his position doesn’t have a monopoly on decency, and 38 Degrees belongs just as much to its members who chose to vote the opposite way to him as it does to those in his Remain camp. As a staff team, it’s our mission to serve a mainstream, inclusive, non-partisan campaigning community, not to privilege the views of some members over others. It became clear to the staff team that there wasn't a clear consensus on Brexit at the beginning of 2016. At a series of regional meet-ups of 38 Degrees local groups, which used an “Open Space” agenda process, Brexit increasingly came up. In Leicester, there was a well-attended session about working together to campaign in favour of Brexit, whilst in Exeter another took place about campaigning for Remain. We started to include questions about the EU in the regular survey we send each week to a random sample of our membership and saw a variety of opinions. Navigating the Brexit debate was going to be challenging and require careful thought and consultation. We devised quite a lengthy survey, which we emailed out twice in late February. The results showed we wouldn’t be able to please everyone – 28 per cent of respondents wanted 38 Degrees to campaign to Remain, 13 per cent to campaign to Leave, and 52 per cent to stay neutral. When asked how they’d feel about 38 Degrees taking different courses of action, 73 per cent said they’d feel “good” or “okay” about 38 Degrees playing a neutral, fact-checking role – this fell to 53% if we campaigned to stay in and 38 per cent if we campaigned to leave. On this basis, the staff team tentatively concluded that the best course of action to serve the 38 Degrees membership was to stay neutral, but play a proactive role in fact-checking and encouraging voter registration (as proposed by different members at different points). We sent out another email to all members, on 7th March, proposing this approach, and inviting members to click Yes or No to indicate whether they agreed. 95 per cent clicked yes, and then completed a follow up survey indicating support for different activities and tactics which they could get involved with. Every week between March and June 23rd we included a question in our weekly survey to 38 Degrees members, asking “Is staying neutral on the EU referendum still right for 38 Degrees”? Every week, members voted yes by a ratio of more than 8 to 1. On June 24th, after the referendum result was announced, the 38 Degrees staff team identified two key challenges: getting input from the membership as to what the organisation should do next; and reaffirming common values and common purpose after a divisive few weeks. We also saw quite a big opportunity – as a movement which genuinely straddled both sides of the referendum debate, our members could be well placed to influence what happened next. “Following our vote to leave Europe, whether people voted to remain or leave is irrelevant." It was on the basis of all this input that 'DIY Brexit' was conceived as a project. The basic idea was to identify key demands for how Brexit should work, which enjoy the broad support of 38 Degrees members across the Leave/Remain divide. The plan is to use this set of demands as a rallying point for people-powered campaigning activities over the coming months – advocacy to MPs, discussion and debate in local neighbourhoods, research and investigative work. For those who voted Leave, this strategy would serve them by helping them seize the opportunities presented by the referendum going the way they’d hoped. For those who voted Remain, this strategy would enable them to make the best of an outcome about which they had grave reservations. So 38 Degrees staff sent out another survey asking members to rank various different issue areas which could form part of a people-powered plan, and to make suggestions for specific content. Alongside this, we worked with a polling company to run some focus groups and opinion polling to give us some additional insights into how our members were feeling in the aftermath of the Brexit vote, and where their views overlapped and differed with public opinion at large. On the basis of all this, staff team drew up a draft set of 75 statements, covering 6 different areas of policy relevant to Brexit: NHS, the economy, trade, immigration, rights, and the environment. We emailed these all out to members, asking for them to vote on each of the individual statements, and to submit comments and additional suggestions. Alongside that, we’ve thus far hosted 17 hour-long conference calls where hundreds of members have discussed the plan with each other. Googledocs of each section of the plan have been made available, with thousands of other comments left there. Shaw identifies some flaws and omissions in the statements the staff team emailed out. So have lots of other 38 Degrees members who’ve participated in the process so far - that was the whole point of sending out a draft and asking for feedback. The staff team is now in the process of working through all those suggestions, identifying proposed amendments, deletions and additions prior to another survey to get another round of feedback. Shaw interprets flaws in the initial draft as deliberate manipulation, accusing the staff team of “shaping and hyping their preferred options and keeping other key options out of play.” Actually the initial draft was flawed because we sent it out quickly, knowing that the best way to identify improvements was to enable the whole membership to feed-in. So for example, Shaw identifies gaps in the statements about immigration which members were asked to feed back on, specifically on the question of Freedom of Movement within the EU. That’s a gap something several members expressed to me on the conference calls I was part of. Options for a statement about that will be drafted and sent out for feedback. Similarly, Shaw talks about the exaggerated and at times deceitful claims made during the referendum campaign – many other 38 Degrees members highlighted the same issue, leading to a proposal to include a demand around giving the ASA the power to regulate political ads. The DIY Brexit project is 38 Degrees’ most ambitious attempt at crowd-sourcing policy so far. We’re better known for relatively straightforward (our critics would say simplistic) campaigns, usually asking the government to stop doing something bad or start doing something good. The consultation process so far has at times been a bit haphazard. The volume of suggestions has been difficult to sift. Some of the conference calls have felt rushed. Some comments left on the google docs have been hard to make sense of. Participation rates (over 300,000 members leaving over 8 million votes or suggestions) are among the highest we’ve ever had, but Shaw’s correct to point out that many 38 Degrees members haven’t yet taken part. Shaw doesn’t offer much evidence for his assertion that the process shows the “power of a small group of unelected people to set the agenda”. Actually it’s been quite a rich process, conducted in good faith. But it’s not gone totally smoothly, and I hope that 38 Degrees’ approach to participative policy-making will improve technologically and methodologically in the future. Post-Brexit lessons for new politics? Martin concludes his piece by disapprovingly quoting Paul Hilder, who in 2008-9 helped found 38 Degrees, and who pointed out recently that Leave campaigners have “learnt many of the lessons of new politics and are well-positioned to apply them”. He implies that Paul’s words should make us more suspicious of the whole idea that politics can and should evolve in a more participative, people-powered direction. While I’m grateful to Shaw for sharing his critique and sparking a debate which I hope will help 38 Degrees improve, I think he risks falling into two quite dangerous traps: assuming that Remain voters are in some way better than Leave voters; and responding to a referendum not going the way you wanted it to by becoming more suspicious of participative and people-powered approaches to politics. I don’t think either of those responses will get us very far. In the aftermath of the shocking murder of Jo Cox MP, 38 Degrees members (including leave voters) donated hundreds of thousands pounds to her memorial fund, inspired by her statement that “we have more in common than that which divides us”. Her words are surely relevant as we grapple with how to work together to secure the best possible Brexit. The second part of our debate. Click here to read Martin Shaw's original article.